Home PAGASA PAGASA Weather Update for TY QUEENIE as of 5:00 AM 04 October 2018. 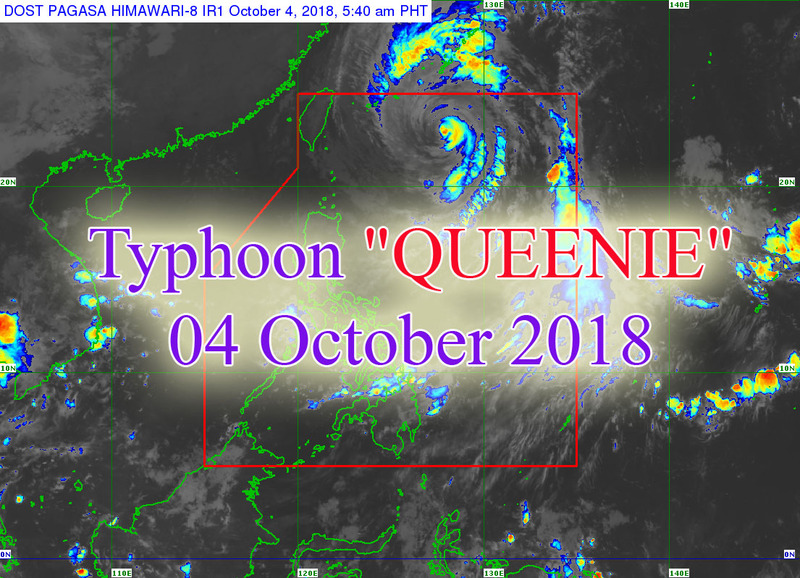 PAGASA Weather Update for TY QUEENIE as of 5:00 AM 04 October 2018. SYNOPSIS: At 3:00 AM today, the eye of Typhoon "QUEENIE" was located based on all available data at 670 km East Northeast of Basco, Batanes (22.6 N, 128.0 E) with maximum sustained winds of 150 km/h near the center and gustiness of up to 185 km/h. It is moving Northwest at 20 km/h. Partly cloudy to cloudy skies with isolated rainshowers or thunderstorms will be experienced over Metro Manila and the rest of NCR-PRSD forecast areas. Light to moderate winds blowing from northwest to southwest will prevail and the coastal waters will be slight to moderate while rough to very rough along the coast of Northern Quezon including Polillo Island. Maulap na kalangitan na may kalat-kalat na mga pag-ulan at pagkidlat-pagkulog sanhi ng extensyon ng Bagyong Queenie ang mararanasan sa Batanes, Cagayan, Isabela, Nueva Vizcaya at Quirino. Bahagyang maulap hanggang sa maulap na kalangitan na may pulu-pulong mga pag-ulan dulot ng lokal na mga pagkidlat-pagkulog ang inaasahan sa mga lalawigan ng Ilocos Norte, Ilocos Sur, La Union, Pangasinan, Abra, Apayao, Benguet, Mt. Province, Ifugao, Kalinga at Aurora. Bahagyang maulap hanggang sa maulap na kalangitan na may pulu-pulong mga pag-ulan ang iiral sa Rehiyong Bikol, Hilagang Samar, Oriental Mindoro, Romblon at Marinduque. Malakas hanggang sa napaka-lakas na hangin mula kanluran hanggang timog-kanluran ang iiral, na may maalon hanggang sa napaka-alon na karagatan. Central and Eastern Visayas will experience cloudy skies with scattered rainshowers and thunderstorm caused by the trough of TY Queenie. Palawan, Occidental Mindoro, and the rest of Visayas will have partly cloudy to cloudy skies with isolated rainshowers or thunderstorms. Moderate to strong winds blowing from the Northwest to Southwest will prevail over the Eastern section of Visayas and its coastal waters will be moderate to rough. Meanwhile, moderate to occasionally strong winds blowing from the South to Southwest will prevail over Palawan, Occidental Mindoro, and the rest of Visayas with slight to moderate seas. Northern Mindanao and Caraga will have cloudy skies with scattered rainshowers and cause by the Trough of TY Queenie. The rest of Mindanao will have partly cloudy to cloudy skies with isolated rainshowers due to localized thunderstorms. Moderate to occasionally strong winds coming from the South to Southwest with moderate to occasionally rough seas.